I’m going to have a do-over. This was finally my first school day to chase icebergs since I retired from teaching in the spring. Luckily, I also had a lunch date with the lovely Rose! The forecast said the fog was going to burn off and it had done so a couple of times on the weekend, turning into beautiful days so I was optimistic as I left Gander and headed towards Harts Cove, Twillingate. I had a lunch date with a long time Facebook friend and it was actually our first meeting as she lives in Texas but has bought and renovated a century home by the sea. With my Come From Away soundtrack on bust I was taken with the trees and reminded of the set on Broadway. I stopped to look at the dead roots and trees on a pond that reminded me of the decor of the musical. There are more green leaves on the Broadway stage than in Newfoundland just now! I saw a small berg through the fog at the causeway to Twillingate Island but decided to wait until the sun came out to stop for a picture on the way home. Purcell’s Harbour was lovely but only had small bergs, maybe even icepans visible. Again, I was reminded of the textures of the Beowulf Boritt stage in looking at the lines and textures of the stages. After too much time lingering I arrived just in time to meet the lovely Rose. Rose and I have become Facebook buddies and she invited me to come visit while she was “home” for a visit. It was lovely to hear her gorgeous Alabama accent. Facebook chats don’t provide details like voice and accents. This is Rose’s second season operating the Twilly House as a tourist rental home. It’s beautiful, even without an iceberg in the front window. She’s already got a good number of bookings for her two bedroom house and is getting preparted for a busy season while blocking out time for her next visit. There was a call while we sat and chatted but the date requested was already booked. She suggested some other properties to the gentleman calling. These properties are a great value for two couples traveling together or families because they are more comfortable and economic than multiple hotel rooms. 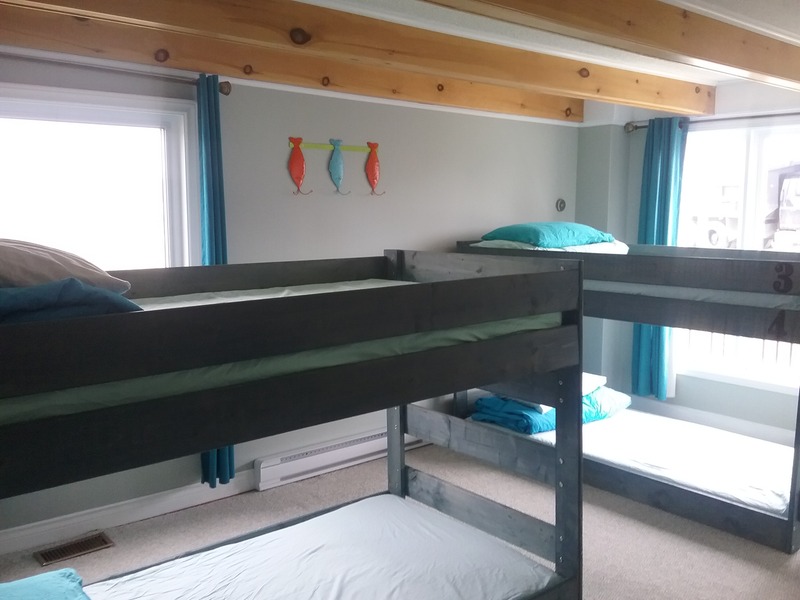 Twillingate rentals book up early for the summer so if you are thinking about it, get busy and book. Through years of visiting her university friend Ruth, Rose has come to love Newfoundland and she and Ruth have worked together to prepare this beautiful retreat. The quilts visible in the pictures are made by Ruth and some are on display for sale. 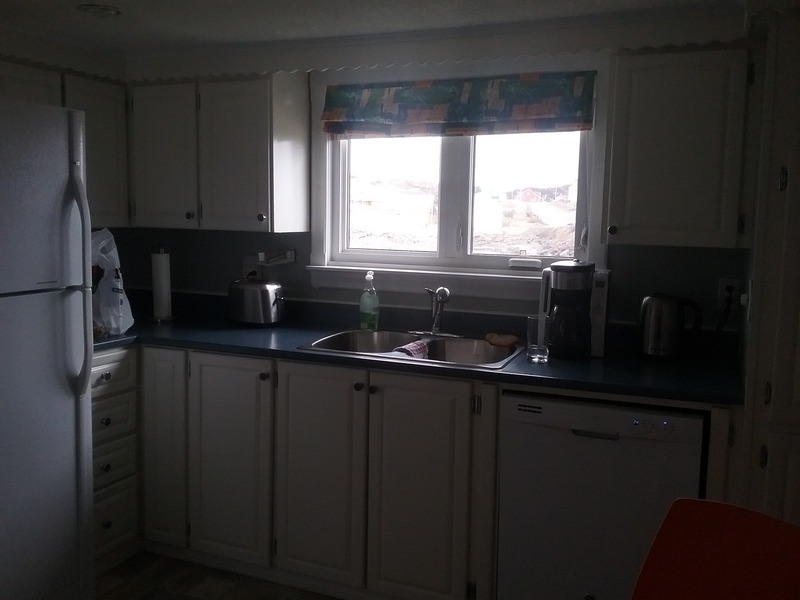 The kitchen is decorated with splashes of colours such as the bowls, chairs and potholders to compliment the beautiful board walls and ceilings. It’s like a doll’s house and she can’t get the smile off her face. It’s beautiful. Rose loves cooking and baking in her new kitchen and I benefitted as a guest for lunch. I even got cookies for the road! We chatted for a couple of hours, as though we’d known each other for years. I look forward to going back for a night at her house in July. It will seem quiet without her. I got a sunny goodbye as I was leaving. I’ll be back to visit when she comes in the fall too! We’re real friends now. From the Twilly House I headed towards the lighthouse at Long Point, stopping to visit with Iceberg Man Cecil Stockley. He’s getting his tour boat and properties ready for the new season. I also stopped to drop off some Iceberg Report cards at the Auk Island Winery and got a tour of their lovely Downhomer Store. 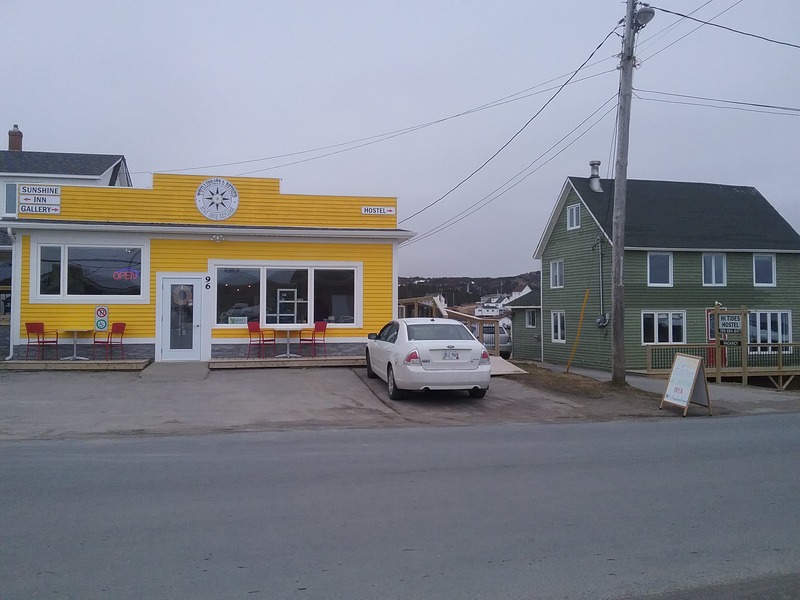 So nice to see so many businesses open and ready in Twillingate. They also were preparing their rental suite for the upcoming season. I met a lovely couple from Saskatchewan at the lighthouse but we saw no icebergs. It was nice to know they’d already been referred to my Newfoundland Iceberg Reports Facebook page by Cecil. I gave them some tips for the Lumsden and Elliston areas and wished them luck. The fog horn sounding is never a good sign when looking for icebergs. 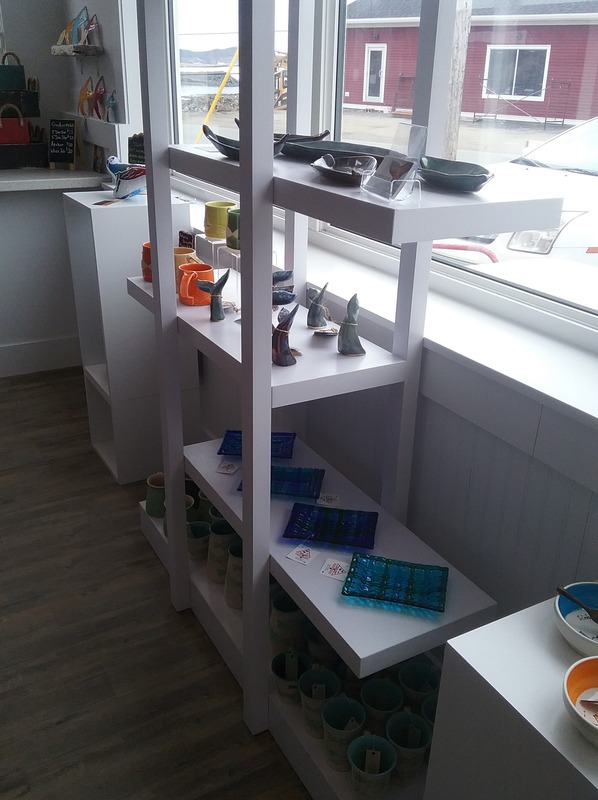 Driving back through Twillingate I could see that the museum is also open and saw a great looking new shop next to a Hostel. Even in the fog, there was lots of sunshine here too. I was greeted by a pair of entreprenerial sisters who proudly told me they’d opened yesterday for the season. In addition to the Sunshine Gallery they have an Inn and the hostel and other properties with their mom. 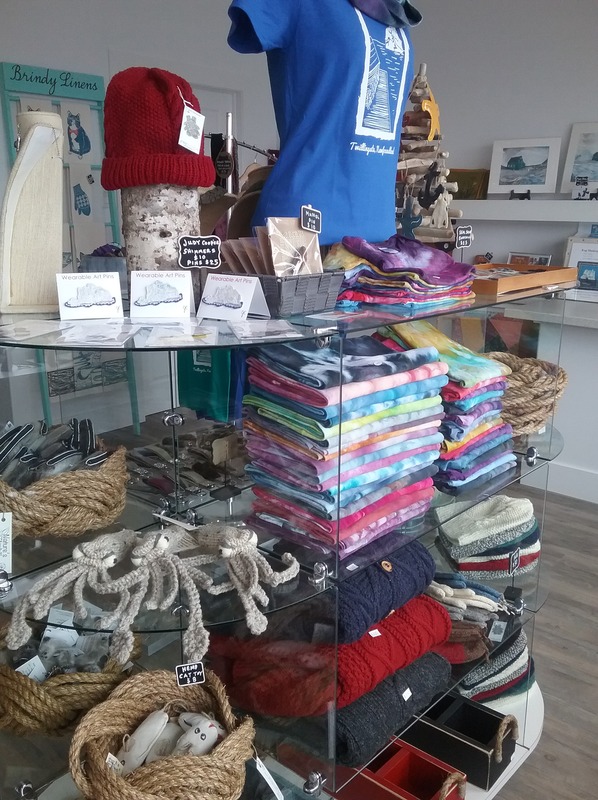 Arts and crafts are all Newfoundland made and beautiful! 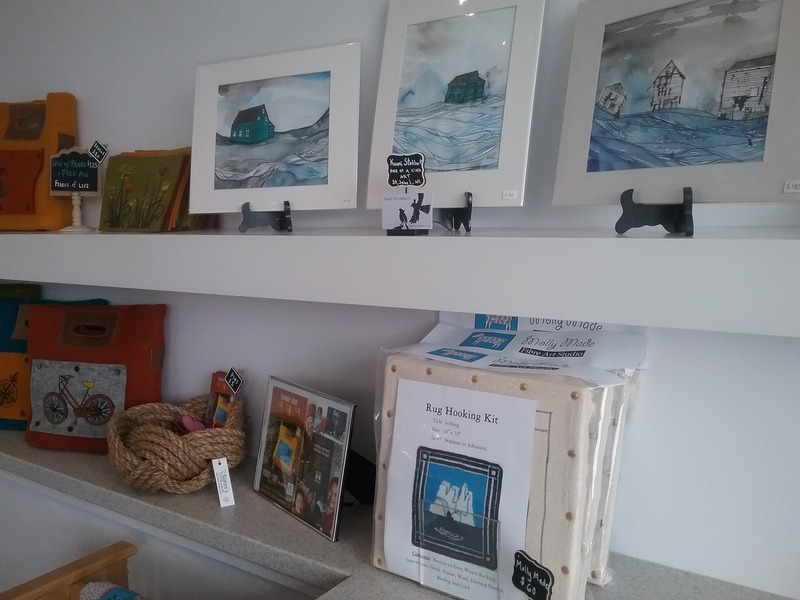 A great iceberg vibe with pictures, paintings, a rug hooking kit and an iceberg stamped dish towel drew me in. I bought the dishtowel. Anyone who’s seen my sink full of dishes will know it’s a decorative purchase. From the Gallery we walked next door to the hostel but because two rooms were rented, I could only view the bunk room and common areas. It’s a great property at a much desired price point for budget travellers. It’s spacious and comfortable and has a live-in manager and a beautiful deck on the water. Including the women I met at the Auk Winery, this was a day of smiling, confident business owners and employees. 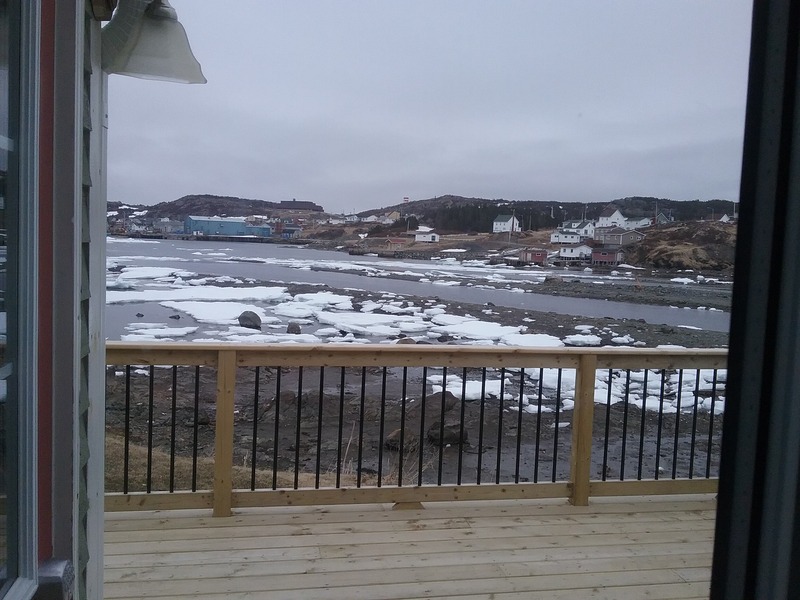 Every business was ready and waiting to welcome guests from around the world and even with only a tiny iceberg, I’m sure travellers in Twillingate saw through the fog as they were welcomed by rays of sunny smiles. Have a great summer ladies and Cecil. You’ve all worked hard! My one little iceberg. I’ll be trying this again! Diane, your posts are like mini vacations! Thank you for writing such lovely stories of small villages in our ever so loved Newfoundland and Labrador.